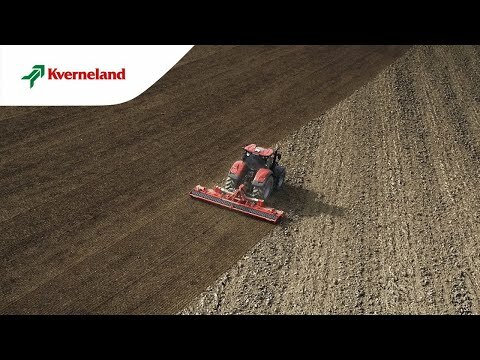 The Kverneland Foldable Power Harrow NG-S 101 F35 is the result of effective operation between cultivation and seeding experts to construct a “state of the art” strong and effective implement designed for tractors up to 350 hp.The new power harrow is available in working widths of 4.0 to 6.0m. The foldable power harrow has the same heavy-duty self-supporting trough design as used on the mounted models and is equipped with the same robust conical bearings and hardened gears. In order to give the NG-S 101 F35 the strongest design and to enable it to withstand the toughest of conditions the upper half of the trough as well as the trough base is made from 10 mm steel plate. The welded conical bearing housings give highest strength to the overall trough. Two large conical bearings with a wide distance providing rigidity and a long service life. The NG-M 101 F35 is equipped with Quick-Fit tines to reduce downtime.